Auto Gorilla OG from shortstuff seeds is a killer new strain from these autoflowering experts. 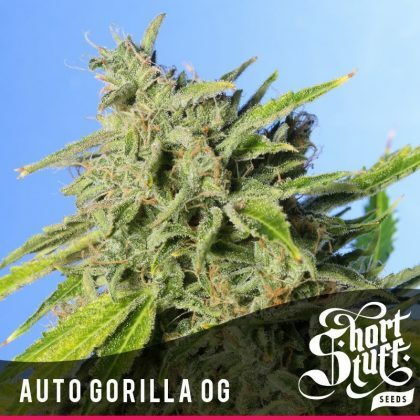 Shortstuff seeds auto gorilla OG is a hybrid of Gorilla Glue #4 and OG kush so if you buy shortstuff auto gorilla OG today you are getting hold of some amazing genetics. The results have blown us away… The trichome count is just out of this world with resin ‘gluing up’ your scissors when you harvest her and mountains of sift being produced when you are manicuring the dried buds. When growing Auto Gorilla OG get ready for some explosive growth from day 1. This strain is really vigourous and pushes out branches and bud sites in all directions while reaching a height of up to 1.2 metres (4 feet). Once she has finished her stretch she will start filling out and the buds will become super chunky and resinous as the trichome production goes into overdrive.